Everyone wants an external door that looks fantastic, Composite Doors offer reliable security protection and insulates your home from the wind, rain and cold. There are many options you need to consider to ensure you select the door that’s right for you. One of the most heavy duty and strong composite doors available anywhere in the UK. The ultimate intruder deterrent – watch our ‘Beat the Burglar’ video on our Home Page to see the proof for yourself. 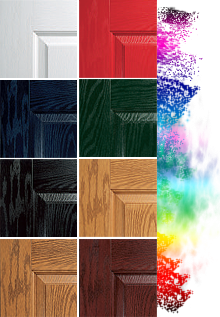 With a wide range of colours available, you can create a traditional look with our woodgrain effect doors, a clean look with White, an elegant look with Red, Blue and Green, or make a dramatic statement with Black. All our doors are manufactured with through-coloured GRP skins so you will never need to paint your door again, and any scratches or knocks it takes over the years will not show. A PAS24 certificate is your guarantee that a composite door has passed a series of rigorous ‘break in’ tests. 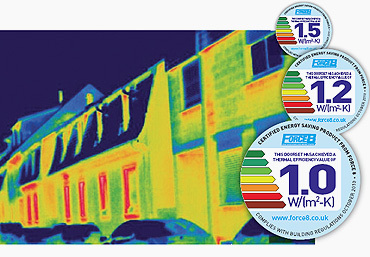 Force 8 composite doors were tested under stringent conditions. Each door component was evaluated. Handles, barrels, glazed panels, door corners, the locking mechanism and of course, the door’s surface were attacked with a broad range of implements. Everything was used from Stanley knives right through to a steel battering ram. Every door within our stylish collection of composite doors has been specifically constructed to be intruder proof. And we’ve achieved PAS24 status to prove it. Force 8 is synonymous with quality. At the forefront of innovation, we constantly enhance and improve both our products and manufacturing processes with new technological advances. Taking our doors to the next level of security and thermal efficiency, we genuinely believe Force 8 offers the best quality products with the lowest U-Values in the industry. Our innovations include: High-security, 5-point locking mechanism: integral, scratch resistant Poly Vinyl Chloride edging delivers far greater thermal efficiency than metal edging, without compromising strength or security. Poly Vinyl Chloride reinforcing: offers significantly greater thermal efficiency than standard metal reinforcements and with a density of 1450kg/m³, strength is not compromised. It even outperforms steel in relation to screw retention properties. And because it’s manufactured from recycled materials, it’s kinder to the environment too.